The Rugby Football Union has confirmed St James' Park as the venue for England's warm-up game against Italy ahead of the 2019 World Cup tournament in Japan. This will also be the first time since 1998, RFU has scheduled a home game for England outside the traditional Twickenham Stadium. According to a report from The Times, every game playing away from Twickenham will cost the governing body approximately close to £10million but chief executive Steve Brown is pleased to take the game across the country. 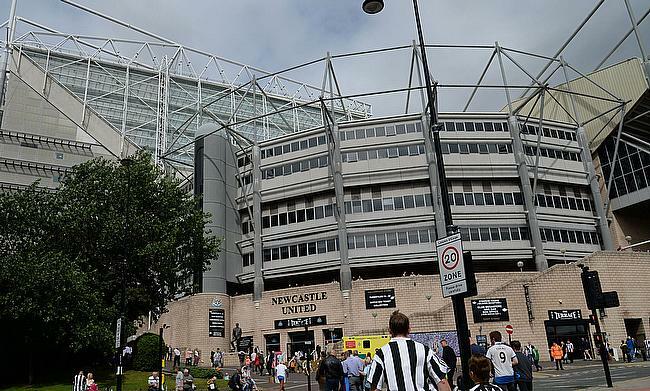 The home of Newcastle United - which will also host the 2019 Heineken Champions Cup final in May - also saw three World Cup games - South Africa versus Scotland, New Zealand versus Tonga and Samoa versus Scotland - hosted at the venue during the 2015 edition. Earlier, this year in March, St James' Park also hosted the Aviva Premiership game between Newcastle Falcons and Northampton Saints that saw 30,174 people turning up. England coach Eddie Jones also had high praises on St James' Park and is looking forward to the atmosphere in the venue. “This is one of the greatest football clubs in England so it’s lovely to have the opportunity to be here," he told nufcTV. "A few of the meetings are at St James’ Park. It’s a great stadium, it was used in the World Cup in 2015.